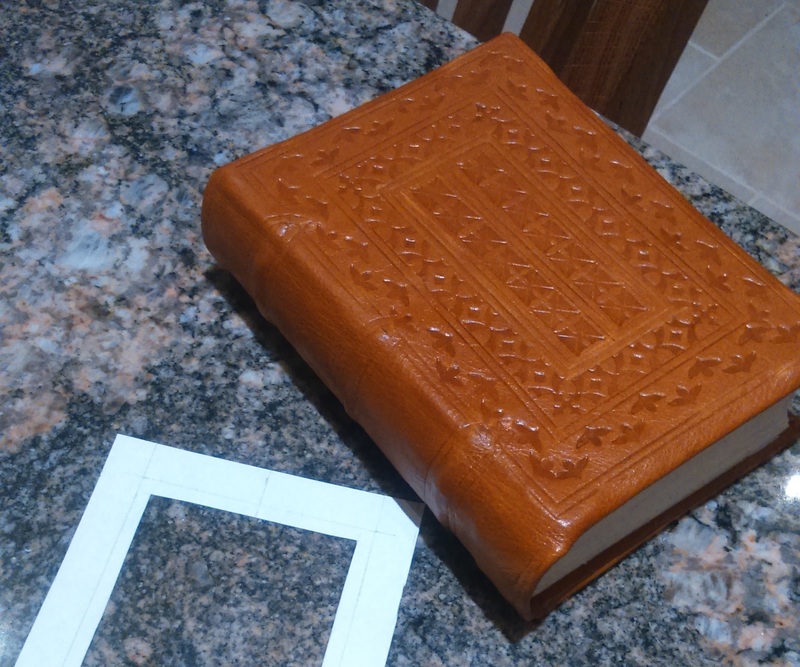 I have just finished binding the oldest book I have yet had the good fortune (and bravery) to repair. It was, when I bought it almost two years ago, a broken little thing with no title page, two loose and bare boards, and a tattered spine that was split and misshapen. It’s been on my list of things to put off and I was doing very well at that, until this happened*. The book is a fascinating history of the life of Francis Xavier, an early Christian missionary in Asia, and supposedly the first to visit Japan among other countries. It’s in Latin, and right now my Latin is about good enough to understand every other word, although with a little more work perhaps I’ll be able to read it a little bit more easily. The book itself was printed in Belgium in 1597, and still contains odd annotations and corrections by almost certainly the original 16th century owner. 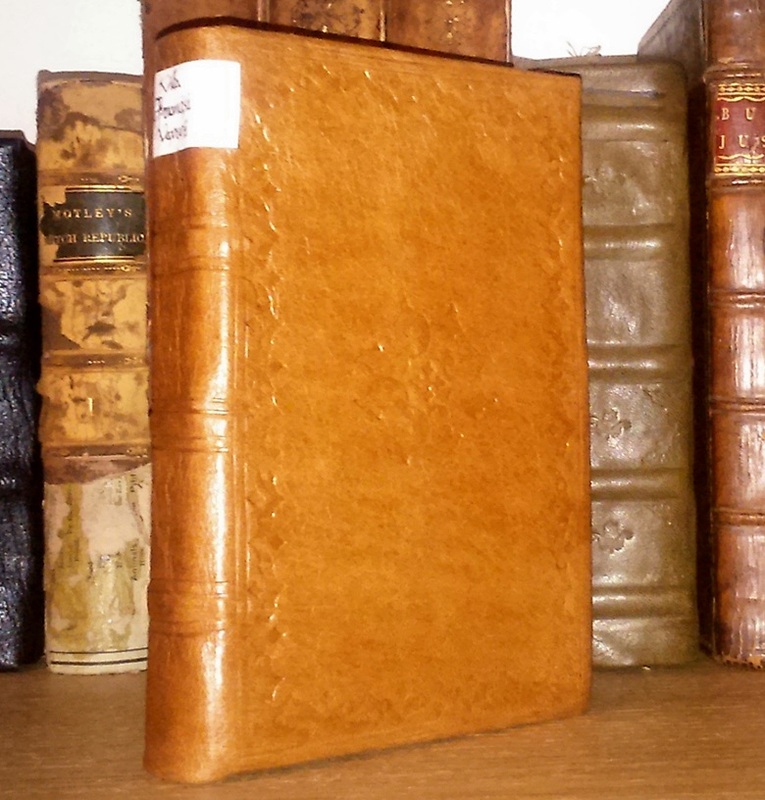 The binding is a personal take on very late 16th/early 17th century English style, with a spine label simply of ink on paper. The handwriting on it is of the period, which is a form of secretary hand that I’ve wanted to learn for a long time. Reshaping the binding was tough – the spine had shifted and broken, before coming damp and almost setting into a weird shape – so the whole body of the 400-year old book had to be carefully adjusted back into the correct shape. Sadly, a late-18th century rebinding of the book had cropped the pages very closely and several annotations and page titles had been truncated. The result of this new binding, though, has a very rustic, medieval feel, and hopefully can now last another few centuries! Until next time, excellent reader! To graves that frosty tears did mourn. It welcomed in the grand New Year. And summer songs will ring about. In two-thousand and then fifteen! I’ll write some lines like these again. I’ve had some trouble finding the will to write for the last few months – but this second poem is my favourite of this rather empty period of poems and therefore I shall end this short post with a short verse, which I hope, kind reader, is a little better than the first. And that’s how I know it’s half past two. Until next time, fondest reader! May the glad tidings of a pleasant new year be a basis upon which I can garble some more kind ramblings about bookbinding. I’ve bound several books over the last month, and two of these bindings have been entirely new volumes using paper designs to help get the tools aligned more accurately. I do all my bindings with individual tools – I have no nice rollers to apply the decoration. It gives the bindings a nice hand-finished feel, but does make them very time consuming and full of often a beyond-charming number of imperfections. 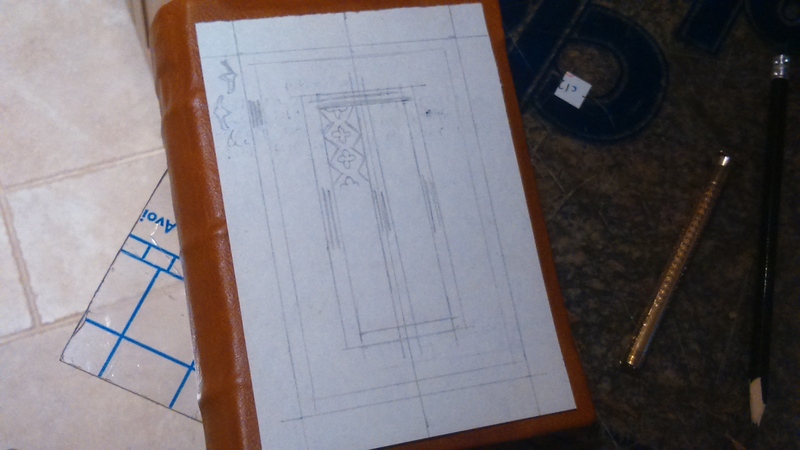 I wanted a simple way around this that still wouldn’t look out of place in a medieval bindery. A couple of times before I’ve drawn out designs on paper and roughly followed them, but what more could I do to represent these designs as accurately as possible on paper? So, very simply, I decided to draw out the designs full scale on a sheet of paper and then use this almost stencil-like to lay out the basics of each board, allowing finer tooling to finish it off over the top. Since this book was a paneled medieval binding, there are a few concentric rectangles. These were the bits that acted as stencils; each rectangle is cut out and then I use a pallet tool to run down the edge of each and create straight lines. 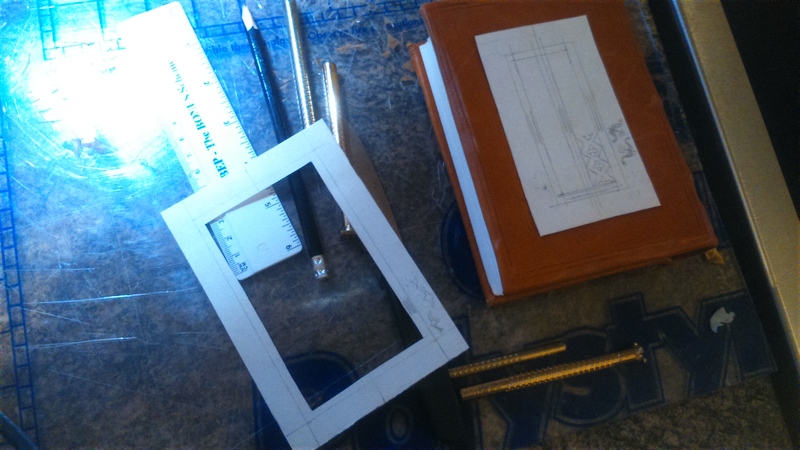 Once each rectangle was cut out and followed round with a tool, the more detailed tooling could finish on top. Not only did this mean I could reproduce accurately and to scale exactly what I’d designed, but it’s also left me with a pattern that I can follow on other books and adapt as I want. Until next time, tenacious reader.